“There’s no crocodile in the waters of Nan river,” a Thai friend once told me. “Many people fish along its banks and there are a lot of floating restaurants especially the part close to the city,” he added. As someone who hailed from a province in the Philippines where several of its rivers are breeding grounds of crocodiles, I believed him. “This ain’t the place for them (referring to Nan),” I thought. 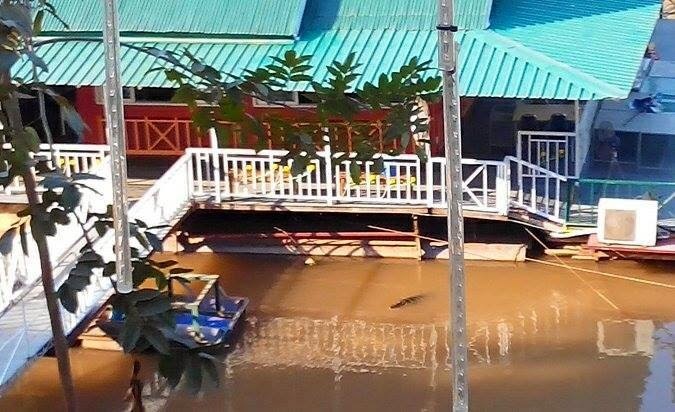 But things suddenly changed when Mr. Simon Watts, my British colleague, posted two nights ago photos of a thing that appears to be a crocodile spotted near a floating restaurant. A few minutes later, likes and comments started flooding in. It was an instant hit! The fame didn’t end just yet. Reporters came to speak to Simon to record a short video. One of the photos made headlines and was featured both on Channel 3 and 7. The thing looks very much like a croc and not a monitor lizard as others suggest. If someone could verify that this is a croc, I wouldn’t be floating a krathong next time. The flickering lights from a distance may not just be the candles. They could also be the eyes of a carnivore.